Our method at Kitiibwa Ministries is simple: empower local schools to provide quality education and breaks the cycles of poverty. ...is a Lugandan word meaning "glory." As a Christian, faith-based nonprofit in Kampala, Uganda, we bring glory to God by helping poverty-stricken children flourish through education, sports, and the Word of God. Our method is simple: empower and equip local schools to provide quality education that breaks the cycles of poverty in vulnerable communities. Then use sports and Bible stories and lessons to give the children an arsenal of skills and desires, as well as a strong foundation. Empowering and equipping locals will allow them to sustain their own communities. While we come in to help teach classes, assist with paperwork, and organize programs, we do not allow the schools to have a complete dependence upon Kitiibwa Ministries to provide for their every need. The school staff members are able to have a sense of accomplishment knowing they are the ones working to grow the school to be self-sustaining because we are their partners and not their owners. Success achieved by locals will last longer and have a larger impact on communities. The UN estimates between 68-70% of children in Uganda will drop out of school before finishing the first seven years of primary school. A 2012 study also found that 3 out of every 10 pupils in primary three could not read and comprehend a primary two level story. At primary seven, the final class in primary school, 2 out of 10 pupils still could not read and comprehend a primary two level story. By supporting local schools, we are on the front lines of helping the most at-risk populations of Uganda get a quality education. The stigma surrounding Kampala slums is if you're born in a slum, you will forever remain in a slum. There are second and third generations of families living in the slums because they were told and believed this lie. By using our three-fold approach of the Word of God, education, and sports, we aim to break the cycle of poverty. The teaching they receive through the Word of God, allows the children to have a firm foundation for the trials and joys they are bound to experience. Having an arsenal of God's promises, scriptures, and bible stories also allows the children to have words to cling to in all circumstances. With proper education, children have the ability to learn more than the previous generations and, not only complete primary schooling, but are able and empowered to go on to complete secondary school and university. The higher the education they receive, the higher their income potential. Our sports ministry gives the children confidence and also restores the childlike attitude of fun and joy. Through our ministry football (soccer) team, children have an opportunity to kick around a real ball, put on legit cleats and a custom uniform, and receive a formal training in sports. These three things are normally only available for upper-class families and are something slum children never imagined they would have access to. Stephen was born and raised in a village outside of Tororo in eastern Uganda. He grew up in a compound with his dad, mom, eight sisters, and one brother, but was also surrounded by numerous other relatives. In 1996, Stephen’s life was forever changed with the sudden death of his father. In 2004, after years of his mother struggling to financially provide for the entire family, Stephen managed to finish his primary schooling and decided to move to Kampala with his older brother. During his secondary schooling in Kampala, he thrived and discovered his passions in life. He joined sports clubs and excelled on the football (soccer) team, became involved in scripture union and was elected assistant chairperson, and discovered his desire for helping others, especially children in low-income situations. However, unable to pay school fees himself and having no one to help him, he was forced to quit attending school. Determined to return to school, Stephen approached the headmaster at a new school and said he would do whatever work the headmaster would give him in exchange for attending school. A few weeks into the term, the headmaster called him into his office and said that someone from America wanted to pay for his school fees and sponsor him through an organization. He was then able to complete his secondary school and went on to study at university, with the financial help of his sponsor. 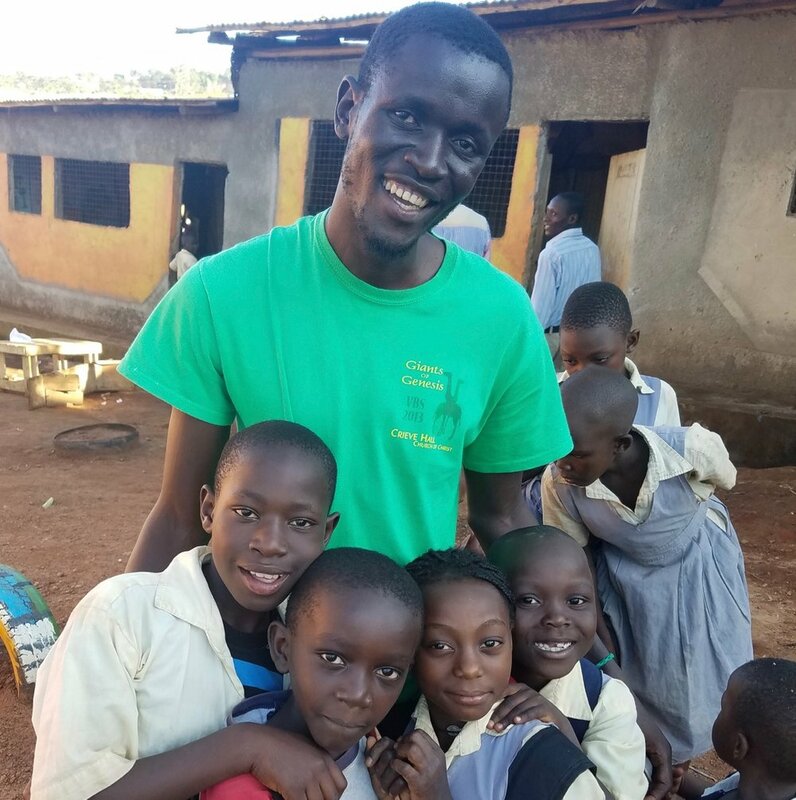 In 2015, Stephen graduated from university with a degree in social work and social administration and immediately began volunteering for the organization that facilitated his sponsorship to finish his school. After being sponsored throughout his school years, Stephen saw the importance of education, especially to those whose parents couldn’t afford the luxury of sending them to school. In 2017, Stephen (along with Cassie) sat down and used the experiences, knowledge, and huge dreams God had put in their hearts to give to the slum communities around the house, specifically regarding education. Because Stephen’s life was forever changed by sponsorship, he wanted to see that another generation of children could have the same opportunities and Kitiibwa Ministries was officially born. Cassie first came to Uganda in July 2011 with a small team from her church, including her dad. As soon as her feet touched the red Ugandan dirt, she knew in her heart that she was home. Having been raised in a Christian house, mission trips and missionaries were a part of regular life. When she was in middle school, she felt the call to go into all the world to make the name of Jesus known. She has worked in Scotland and participated in a large mission trip called the World Race, where she was able to serve in 11 different countries over 11 months (Ecuador, Peru, Bolivia, Romania, Ukraine, South Africa, Mozambique, Swaziland, Thailand, Cambodia, and Malaysia). After returning to Uganda four more times from 2012-2016, she felt the call to quit her full-time job in the states and return to Uganda full time. She felt it was also time to step out from under the organization she was previously working with and begin the ministry God had given her a dream and a vision for, which has become Kitiibwa Ministries. Cassie’s parents, two younger sisters, and younger brother still live in a suburb outside of Kansas City, and lovingly take care of her dog, while she is in Uganda. Her parents and sisters have also been to Uganda in years past and all have plans to return again soon. Cassie has degrees in journalism and photography, with minor coursework in social media, public relations, and graphic design. Kitiibwa Ministries began with a small house and a big dream that has led us to impacting over 400 children a week in Kampala's slums. The dream for the house was to have a space where God’s glory was ever present- where children could come for meals, encouragement, prayer, education, and fellowship. It was a space where social status was left at the door before entering. Kitiibwa Home quickly grew into Kitiibwa Ministries. We knew we wanted to encourage and build up people who were already hard at work with their organizations, but needed help to continue growing. Located in two different slums in Kampala, Uganda, both schools had a solid foundation and vision but needed help encouraging the children. We came alongside them and became ministry partners. Unfortunately, the government has closed down one of the schools since then. Every week, we interact with more than 400 children. We help educate in the classrooms. We teach Bible stories and study the Word of God. We are cheerleaders, spurring the children on to bigger and better things. We remind them to be children again by playing games, dancing, and singing songs. We don't limit them based on their social status.